Last week it donned on me I started this blog four years ago this month. It was a time of change and many unknowns. I had just lost my full time status at my work place after ten years. I was married to a wonderful man but just three months into our marriage, the loss in wages and healthcare made me feel like a burden. I think this was the first time I cried in front of my husband. I was afraid and a bit angry because I felt my workplace failed me. I was afraid I wouldn’t find a new job, afraid I wouldn’t be successful and I needed a voice. That voice came in the form of this blog. I never thought my blog would capture anyone’s attention and really wasn’t sure anyone other than my husband and my mom were even reading. I’ve had some wonderful experiences since I wrote my first words; Wine Chicks Guide was a featured blog on Everyday with Rachel Ray online magazine which landed me a wonderful Ravenswood PR event in Sonoma through Constellation Brands. Then in 2012 I received a scholarship to the 2012 Wine Bloggers Conference in Portland, OR. After four months of writing my blog I received my first sample, Cakebread Cabernet Sauvignon and my latest “who’d have thought” books sent to me from various publishers. 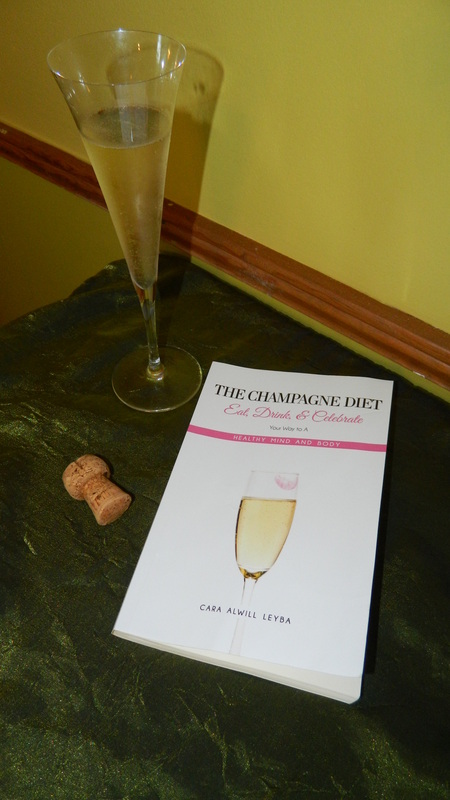 Recently I received The Champagne Diet – Eat, Drink & Celebrate You’re Way to A Healthy Mind and Body – by Cara Alwill Leyba. If you’ve read my blog enough you know I adore bubbly and I don’t need a special occasion to pop a bottle of the effervescent wine. Cara also shares my love of all things sparkly, especially wine. Before you buy out the Champagne section in your local store, I have to let you in on a secret. The Champagne Diet doesn’t just speak to what and how much you put into your mouth but also focuses on what you put into your head. It’s a lifestyle guide that speaks to ditching the old destructive habits that have kept you from reaching your potential and incorporating healthy habits into your life. I mean come on, you can be cleaning the toilet but put a beautiful fluted glass in hand and you instantly feel glamorous. I haven’t actually cleaned the toilet while sipping on sparkling but I’m sure it would make the task a bit more fun. While there are no restrictions Cara does recognize you can not live a healthy life style while filling up on Big Mac’s, Doritos, cola (regular or diet), fried foods and all those other foods we all know are best enjoyed on rare occasions. Here’s my take on the book, the diet is about changing your mind set. Once you begin eating healthy, working out by doing something you enjoy (mine is walking Rooster for an hour in the beautiful country setting) and by not giving into negative emotions (I need to work on this one) you can reach your potential. If you feel good about the things you’re doing, you’re more likely to stick to them making you a happier and healthier person. I want to clarify reaching your potential doesn’t mean you’re wearing a size 2, starving yourself or working out like a maniac. It also doesn’t mean you need to marry a multi-millionaire or become CEO at a Fortune 500 company. You just need to be healthy and happy with where you are in your life. Oh and you can do it with a glass of Champagne in hand. You didn’t think I’d not post a recommendation on a sparkling wine did you? My favorite everyday go-to sparkling wine is R.S.V.P Brut Sparkling Wine from Trader Joe’s for just $5.99. Made in the Methode Champenoise the dry wine has fine bubbles with flavors of crisp apples and toast. I’ve served this to several out of town visitors and each was surprised when I tell them it costs just $5.99 as it drinks like a wine twice that price. So go on, ditch the negative thoughts, the frumpy clothes and pick up a copy of The Champagne Diet for just $12.99. Oh and you may want to get yourself a bottle of Champagne while you’re out. For more information on Cara check out her blog: The Champagne Diet or you can follow her on Facebook by clicking here. While you’re at it, pop on over to Wine Chicks Guide and follow me on Facebook too. This entry was posted in Books, Sparkling Wines and tagged Cara Alwill Leyba, Health and wellness, R.S.V.P Sparkling Wine Trader Joe's, Sparkling Wine, The Champagne Diet, Wine Chicks Guide. Bookmark the permalink.